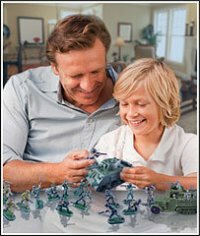 School projects and diorama building will enhance your child's learning experience and can lead to a new found interest in historical events ranging from medieval warfare to the Battle of Gettysburg. 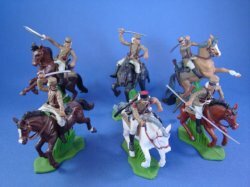 54mm (approximately 2.5 inches tall) hand painted plastic toy soldiers from Britains Deetail and DSG of Argentina are ideal for school projects. Simply add scenery and other elements and watch history come alive for your student! Battlefield Legends Toy Soldiers offers a full line of affordable historical figure sets including Caesar's Roman Legion, Vikings, US 7th Cavalry, US Buffalo Soldiers, Plains Indians, American Civil War Union and Confederates, Spanish American War US Rough Riders, Napoleonic Wars French and British line infantry, Battle of the Alamo Mexican soldiers, World War II sets and more. All figures are hand painted and ready for display. Inexpensive styrofoam insulation from your local building supply store can be used as a diorama base. Mountains can be created by layering the styrofoam and gently sanding the edges to produce small hills. Green or tan acrylic paint can be applied as a base color with other scenic materials added (small rocks, trees, twigs as fallen trees, fencing, artificial grass, buildings and other accessories available from your local craft or hobby store). Below is just a partial list of figures available for your school diorama project.